Gallery View shows all the participants’ videos. Speaker View shows the presenters’ videos. You need a camera to share your video, but you don't need one to see other people's videos. 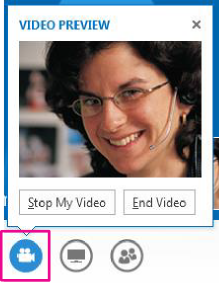 Click in the Lync main window, then click Video Device. If your don't see your video preview, make sure the camera is working correctly. To adjust settings, click Camera Settings. 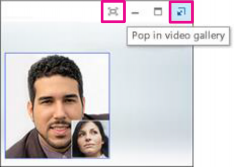 Pause on a contact's picture and click the camera button. 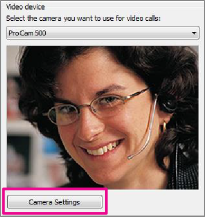 TIP You can also click the camera button to add video to an IM or conference call. 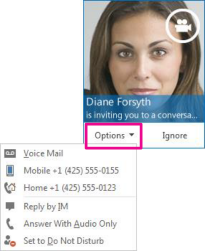 Select many contacts by holding down the Ctrl key and clicking the names. 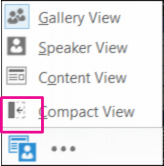 In the conversation window, pause on the people button, and click Invite More People. 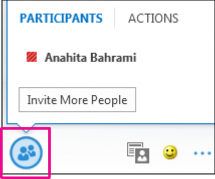 Select the invitees from the Add People window, and click Add. TIP Click End Video to stop sharing your video with others AND end their video feeds to you.